A design exception documents design elements of an improvement that vary from engineering policy. In most cases the need for an exception results from an inability to reasonably meet the design criteria. An approved exception simply documents the engineering-based determination that variance from MoDOT’s engineering policy is necessary and appropriate. It is the primary tool to detail not only the decision itself, but also what was considered when the decision was made. When there is doubt whether a design exception is required, the Engineering Policy Administrator, Assistant State Bridge Engineer or the Design Liaison Engineer (DLE) for the district should be consulted. A design exception is encouraged whenever it is feasibly or technically impossible to reasonably meet the preferred design criteria or wherever there is potential for additional value outside of written engineering policy. Design exceptions should not be considered breaches of policy as much as opportunities to add practicality or value to the design. An approved exception is not a request for permission; rather, it simply documents deliberate variances from engineering policy. There are 10 controlling criteria that the FHWA has identified as the most important or critical elements for the design of projects on the NHS. Projects designated for federal involvement on design exceptions in the PODI matrix, located on an NHS Route, require a MoDOT and FHWA approved written design exception if a controlling criteria, as established in MoDOT’s EPG, is not met for any of the 10 elements listed in Table 131.1.2. A MoDOT (only) approved design exception is required for all other non -complying design elements on projects which are designated for federal involvement for design exceptions and for all non-complying design elements on all of other projects not designated for federal involvement for design exceptions. * Applicable Controlling Criteria as indicated in EPG 131.1.2. See EPG 123.1.1 FHWA Oversight - National Highway System for information on federal involvement on projects and for the PODI matrix. Requests for design exceptions are submitted when the need first arises; however, they may be submitted at any time and specifically along with the conceptual study, preliminary plan, right of way certification, or plans, specifications, and estimate (PS&E). In general, it is best to identify and consider the design exception as early as practical in the design process. Project managers (consultant, transportation or bridge) and their design staff should recognize the importance of an open and transparent decision making process while considering the suitability and appropriateness of a given design element that is not consistent with our current policies. Since our engineering policy is established through a collaborative effort, it is critical to engage all appropriate staff when making the decision not to meet our policies. While completing the form, communication with the appropriate staff, including the Design Liaison Engineer, a representative of any affected MoDOT division and FHWA (when applicable), is critical to ensure efficient and effective review and approval. For efficient processing and to avoid delays, this communication should occur prior to the formal submittal. Depending upon the item being excepted and the type of project, the appropriate review staff and signatory parties will vary. Central Office staff should be consulted and provide review of the draft design exception prior to district approval. A link to the electronic copy of every fully approved design exception is provided to the Central Office Design Division and Central Office Bridge Division, as appropriate. A final copy of the design exception is saved in eProjects using the appropriate content type: DE Letting Documents. Staff should include any pertinent information in the Comments Section within eProjects. 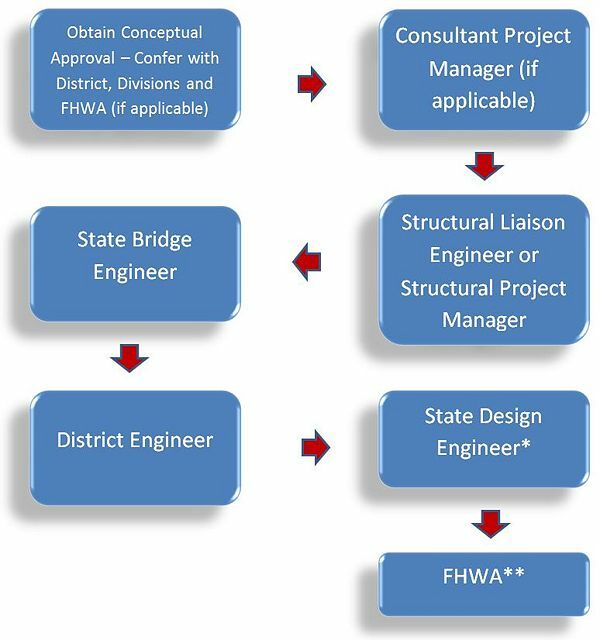 PODI design exceptions are processed through the Design Liaisons for the State Design Engineer and FHWA signatures of approval. The Design Liaisons provide the electronic copy of the fully approved design exception back to the PM for placement in eProjects. It should be noted that the Federal Highway Administration (FHWA) reserves the right to audit the design exceptions of any federal aid project regardless of level of oversight. In addition to the applicable process requirements described below, vertical clearance design exceptions on the interstate must also follow the additional requirement described in EPG 131.1.7 Deficient Vertical Clearances on Interstates. 1)	The Transportation Project Manager (TPM) working with the Consultant Project Manager, if applicable, submits the design exception form, submittal letter and supporting information to the Design Liaison Engineer (DLE), the District Design Engineer (DDE), FHWA (if applicable) and any other pertinent district and division staff. 2)	The contacted division and district representatives will respond with any necessary comments or concerns, request additional information if necessary or will request an opportunity to meet and discuss the issue. 3)	The TPM works with staff to appropriately address or resolve comments, concerns or objections and finalizes the design exception. 4)	The TPM submits the design exception for signature according to flowchart below. Route as appropriate to obtain approvals in the appropriate order. * Note: Concurrence only if not indicated that federal approval is required in accordance with EPG 131.1.3 and the PODI matrix. ** Note: Omitted if not indicated that federal approval is required in accordance with EPG 131.1.3 and the PODI matrix. 1. 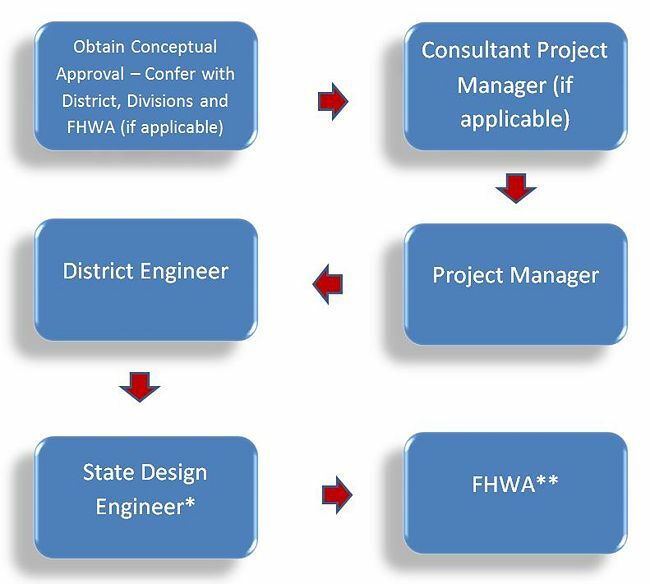 The Structural Project Manager (SPM), or the Structural Liaison Engineer (SLE) working with the Consultant Project Manager submits the design exception form, submittal letter and supporting information to the Assistant State Bridge Engineer, the Design Liaison Engineer (DLE), the Transportation Project Manager, FHWA (if applicable) and any other pertinent district and division staff. 2. The contacted division and district representatives will respond with any necessary comments or concerns, request additional information if necessary or will request an opportunity to meet and discuss the issue (if significant objection is determined). 3. The SPM/SLE works with staff to appropriately address or resolve comments, concerns or objections and finalizes the design exception. 4. The SPM/SLE submits the design exception for signature according to the flowchart below. Occasionally, both roadway and bridge items will need to be included. In these instances, the TPM and the SLE/SLM should agree to a single point of contact for the review, concurrence and approval of the design exception and will ensure that the appropriate staff members are properly engaged throughout the process. The review and concurrence process is intended to avoid any significant objections, questions or concerns during the approval process, however, occasionally these issues may arise. In this instance, the design exception approval process may be put on hold until the issue can be resolved by the appropriate staff members. The TPM or SLE/SLM will remain the primary contact to address any request for additional information or consideration. As design exceptions serve as the permanent record of the design decision, providing a design exception numbering and logging system will benefit tracking the submittal and return of each exception and to ensure that all design exceptions are acknowledged and accounted for. The preferred design exception numbering system is the job number followed by a sequential number for each design exception. For example, the first roadway design exception for project JXPXXXX would be Design Exception (DE) # JXPXXXX-R1. The second would be JXPXXXX-R2, and so forth. The first bridge design exception for project JXPXXXX would be DE# JXPXXXX-B1. If a design exception includes both roadway and bridge items, it will be numbered and logged according to who initiates the design exception. The logging system in each project file should indicate the design exception number and the date submitted and date received. If a design exception is not approved, the number should be recorded and noted that it was not approved. The next design exception would be numbered with the next available number. Additionally, as a best management practice, the design exception log and the design exceptions themselves may be located in the project file or a project SharePoint site. Whenever the engineering policy cannot be met, data for only those non-standard items is listed. This data includes a brief description of the project and the improvement goals that are being attempted. This information is required since the context of the project often helps in deciding if approval of the exception is appropriate. Additionally, the data should include the details related to the existing feature (if applicable), the desired design criteria for that feature, the proposed solution, and the location (limits) associated with the solution. The column shown for existing features is not applicable to new construction. The appropriate values for desired design criteria are shown in the second column. The design criteria for new construction on rural and urban highways are stated in individual articles pertaining to each geometric element discussed in the EPG 200 Geometrics articles. Design criteria for 3R and 4R projects are discussed in EPG 128 Conceptual Studies. The criteria for proper access management can be found in EPG Access Management. All design exceptions must suitably explain the justification for the exception. It is imperative that this justification be sufficiently complete to clearly reflect that the designer exercised reasonable care in the selection of a particular highway design. Design exceptions often arise because it is impractical or impossible to reasonably meet engineering policy. The justification may include appropriate economic analysis, discussion of applicable accident location and type or discussion of avoidance of Section 4(f) or Section 6(f) lands. The justification supports the concept that maximum service and safety benefits were realized for the cost invested. Engineering judgment is used when balancing the economic and engineering reasons for the justification. A design exception is based on sound engineering judgment rather than being solely an attempt to save cost. Specific design criteria that will not be met. Comparison of the safety and operational performance of the roadway and other impacts such as right-of-way, community, environmental, cost, and usability by all modes of transportation. Compatibility with adjacent sections of roadway. Note: The level of analysis should be commensurate with the complexity of the project. Measures used in transitions to adjacent sections with higher or lower design or operating speeds. Verification of safe load-carrying capacity (load rating) for all state unrestricted legal loads or routine permit loads, and in the case of bridges and tunnels on the interstate, all federal legal loads. If the design exception request involves any features that are safety related, then sufficient crash data and history is attached to the request to support the reasons for justification. A summary report of the crash information is acceptable if the volume of the data is excessive. Examples of safety related features include, but not limited to, the following: design speed, stopping sight distance, passing sight distance, lane width, shoulder width, shoulder type, rumble strips, turn lanes, bridge width, bridge approach rail, horizontal alignment, vertical alignment, grade, horizontal clearance, vertical clearance, guardrail, etc. Any other items that may be perceived as a safety concern will also follow these requirements. Calculate the expected change in crashes from existing conditions to the proposed design. The proposed design should take into account any design exceptions as well as any additional safety features above and beyond the standard design. By making these two determinations, a quantitative safety comparison can be made between existing conditions, the standard design, and the proposed design. This information, along with other project considerations, can be used to help determine the best design alternative. A list of features currently addressed by the manual include: lane width, shoulder width, shoulder type, center line rumble strips, horizontal alignment (length, radius), grade, roadside hazard rating, fixed objects, driveway density, median width, sideslope, lighting, intersection skew angle and turn lanes. Not all features in the manual are addressed for each facility type. Changes in project scope or design criteria can result in changes to design exceptions that have previously been considered. In these cases, a revised design exception must be completed and approved (as described above). The original design exception should accompany the revised information in order to illustrate the changes. The transmittal letter should address the changes and an explanation of the circumstances leading to the revision. 1. For a vertical clearance over any interstate highway that will be less than 16 ft. meeting the above criteria, the district submits to the Design Division a completed SDDCTEA Interstate Vertical Clearance Coordination Form along with a Design Exception for vertical clearance. 2 The Design Liaison Engineer emails the Bridge Inventory Analysts and requests the Structure NBI number for box 2 on the Vertical Clearance Design Exception Coordination with SDDCTEA Form. 3. Concurrent with the submission or routing of the Design Exception, the Design Liaison Engineer submits the form to the SDDCTEA and copies FHWA. This may be done electronically using the contact information on the Vertical Clearance Design Exception Coordination with SDDCTEA. 4. A response from SDDCTEA should occur within 10 working days following receipt of the coordination request. Receipt of the request can be verified with SDDCTEA via telephone or fax. If there is no response after 10 working days following receipt, it can be determined that SDDCTEA does not have any concerns about the proposed exception. 5. The Design Liaison Engineer informs FHWA as to the final outcome of the SDDCTEA request. This page was last modified on 5 March 2019, at 09:35.